This 2005 photograph depicted a female Anopheles albimanus mosquito, while she was feeding on a human host, thereby, becoming engorged with blood . Like other species in the genus Anopheles, A. albimanus adults hold the major axis of the body more perpendicularly to the surface of the skin when blood feeding. Anopheles spp. adults also generally feed in the evening, or early morning when it is still dark. 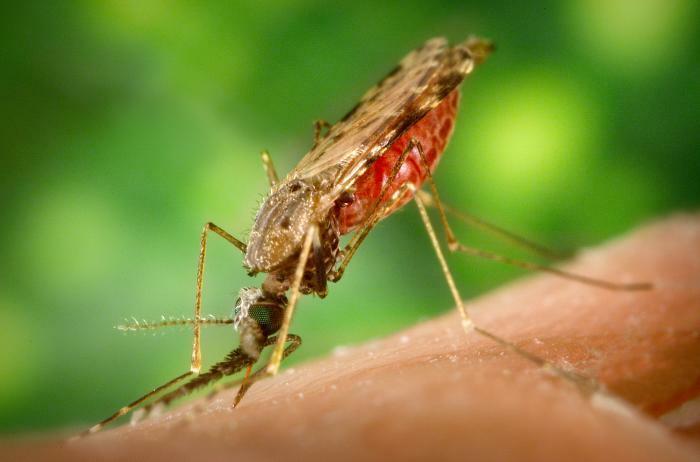 This species is a vector of malaria, predominantly in Central America. James Gathany, “Malaria-carrying mosquito,” USU Digital Exhibits, accessed April 20, 2019, http://exhibits.lib.usu.edu/items/show/18777.